Hospital. Allegedly a linear left parietal fracture of the skull was noted on x-ray. Dr. Hale focused on Dr. Walter Camp's evaluation of changes in Tommy's personality subsequent to the accident. He felt these changes suggested a neurological dysfunction, the nature of which could induce uncontrollable seizures of rage accompanied, potentially, by lapses in consciousness. 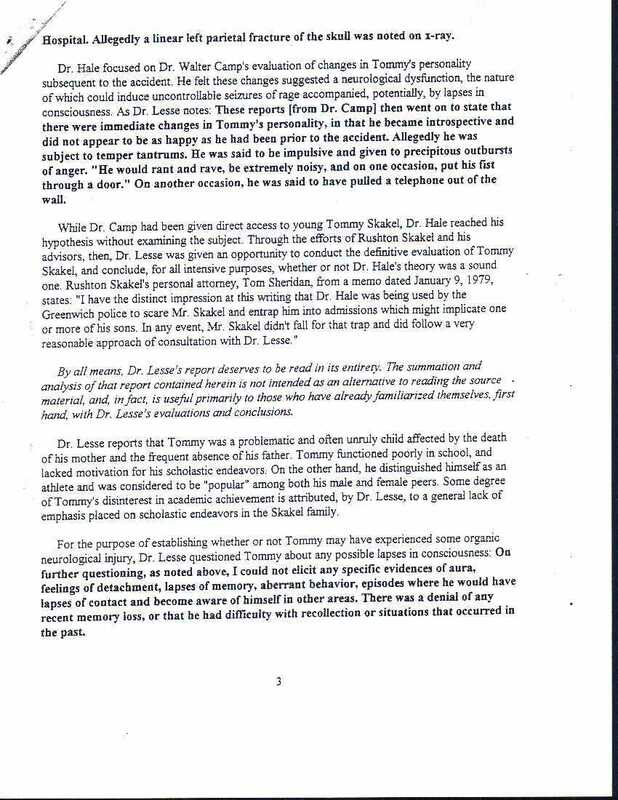 As Dr. Lesse notes: These reports [from Dr. Camp] then went on to state that there were immediate changes in Tommy's personality, in that became introspective and did not appear to be as happy as be had been prior to the accident. Allegedly he was subject to temper tantrums. He was said to be impulsive and given to precipitous outbursts of anger. "He would rant and rave, be extremely noisy, and on one occasion, put his fist through a door." On another occasion, be was said to have pulled a telephone out of the wall. While Dr. Camp had been given direct access to young Tommy Skakel, Dr. Hale reached his hypothesis without examining the subject. Through the efforts of Rushton Skakel and his advisors, then, Dr. Lesse was given an opportunity to conduct the definitive evaluation of Tommy Skakel, and conclude, for all intensive purposes, whether or not Dr. Hale's theory was a sound one. Rushton Skakel's personal attorney, Tom Sheriden from a memo dated January 9, 1979, states: "I have the distinct impression at this writing that Dr. Hale was being used by the Greenwich police to scare Mr. Skakel and entrap him into admissions which might implicate one or more of his sons. In any event, Mr. Skakel didn't fall for that trap and did follow a very reasonable approach of consultation with Dr. Lesse." By all means, Dr. Lesse's report deserves to be read in its entirety. The summation and analysis of that report contained herein is not intended as an alternative to reading the source material, and, in fact, is useful primarily to those who have already familiarized themselves, first hand, with Dr. Lesse's evaluations and conclusions. Dr. Lesse reports that Tommy was a problematic and often unruly child affected by the death of his mother and the frequent absence of his father. Tommy functioned poorly in school, and lacked motivation for his scholastic endeavors: On the other hand, he distinguished himself as an athlete and was considered to be "popular" among both his male and female peers. Some degree of Tommy's disinterest in academic achievement is attributed, by Dr. Lesse, to a general lack of emphasis placed on scholastic endeavors in the Skakel family. For the purpose of establishing whether or not Tommy may have experienced some organic neurological injury, Dr. Lesse questioned Tommy about any possible lapses in consciousness: On further questioning, as noted above, I could not elicit any specific evidences of aura, feelings of detachment, lapses of memory, aberrant behavior, episodes where he would have lapses of contact and become aware of himself in other areas. There was a denial of any recent memory loss, or that he had difficulty with recollection or situations that occurred in the past.